SINGAPORE--(BUSINESS WIRE)--Oct. 25, 2018-- MicroStrategy® Incorporated (Nasdaq: MSTR), a leading worldwide provider of enterprise analytics and mobility software, today announced that it won a NetworkWorld Asia 2018 Readers’ Choice Product Excellence Award in the Data Analytics and Business Intelligence category. 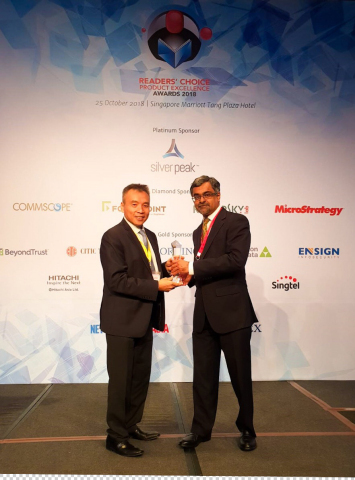 MicroStrategy, which secured the top spot for the only award related to analytics and business intelligence, was honored yesterday at the NetworkWorld Asia 2018 Readers’ Choice Awards that was held at the Singapore Marriott Tang Plaza Hotel. The 2018 Readers’ Choice Product Excellence Awards recognize both established and new solution providers that have made the most impact on Asian end-user organizations in 2018 based on votes from qualified readers of NetworkWorld Asia, Asia Cloud Forum, Security Asia, and Storage Asia. Readers chose MicroStrategy as the top technology vendor out of 21 business intelligence providers. Download the free MicroStrategy Desktop™ tool today to learn more about how your organization can get started on its journey to become an Intelligent Enterprise. MicroStrategy (Nasdaq: MSTR) is a worldwide leader in enterprise analytics and mobility software. A pioneer in the BI and analytics space, MicroStrategy delivers innovative software that empowers people to make better decisions and transform the way they do business. We provide our enterprise customers with world-class software and expert services so they can deploy unique intelligence applications. To learn more, visit MicroStrategy online and follow us on LinkedIn, Twitter, and Facebook. MicroStrategy, MicroStrategy Desktop, and Intelligent Enterprise are either trademarks or registered trademarks of MicroStrategy Incorporated in the United States and certain other countries. Other product and company names mentioned herein may be the trademarks of their respective owners.